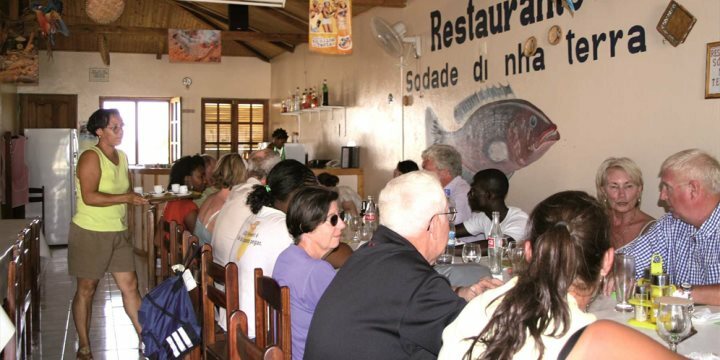 You will find a selection of restaurants in the main towns offering local Creole dishes as well as some international cuisine and many will have live Cape Verdean music at least once a week. There are numerous bars and restaurants in resort areas such as Santa Maria (on the island of Sal) and Mindelo (on the island of São Vicente) and the music at weekends, can last long into the night. There are a couple of venues that offer occasional flim nights in Santa Maria also. May of the bars in the main resort centres offer free Wi-Fi, and regular happy hours usually around 4-6pm. The smaller or quieter islands including Boa Vista do not have such a wide selection of dishes and the limited menu may well be what they have prepared on the day. Prices do vary - expect to pay the equivalent of between €25-€30 for a three course meal with local wine. Local beer is usually around 150CVEsc per pint. Find out more about food & drink in Cape Verde on our blog. In Cape Verde there is an abundance of freshly caught seafood including tuna wahoo, bica and lobster. Vegetarians are increasingly well catered for on hotels with many offering a vegetarian dish or cooking something to order however in local restaurants the choice will be more limited with a pasta dish or omlette typically offered. Our representative in resort will be able to offer advice about the current reputation of restaurants and any new establishments that may have opened. A fish restaurant with beautiful food and great service. Morabeza's Cape Verdean Buffet and live music nights (must pre-book as very popular). Excellent seafood, small with atmosphere. French cuisine. Impressive setting right on the beach, perfect for a special occasion. Good Value for money, large selection of fish (depending on what seasonally available). Cape Verdean buffet where you pay by the weight of the food! 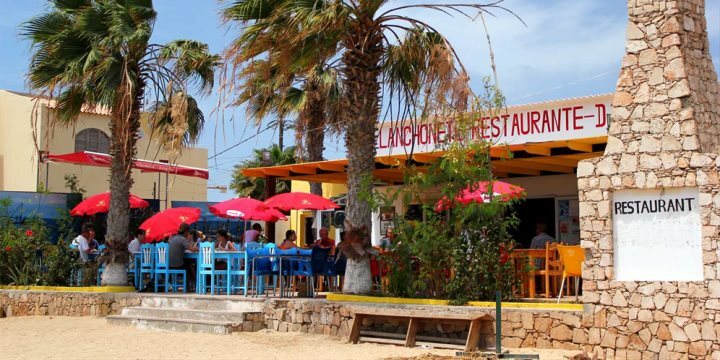 English owned on the beach with a large menu serving tapas, fish and chips and Sunday roasts! A mixture of British, Chinese, Cape Verdean food..! Cape Verdean cafe serving buffet lunch and local snacks - you pay by the weight of the food! Cape Verdean buffet and live music nights - you pay by the weight of the food! A Tapas bar - Cape Verdean style! No specific menu but great food and popular with the locals. A true Cape Verdean experience. Fantastic location in the city centre overlooking the square, serving fish, steak and pizzas. Specialises in Italian food, fresh fish and seafood. Next door to the Pestana Tropico hotel, Pescador is a sophisticated restaurant with great service and quality fresh fish. Specialises in typical Cape Verdean and European cuisine with live music Monday to Saturday. A typically Cape Verdean restaurant with great grilled fish especially tuna "barriga de atum" with cooked vegetables. A Cape Verdean & European cuisine restaurant serving local dishes with live music with great feedback. Cachupa Rica - Cape Verde's national dish, a stew made with fish, meat and vegetables. Buzio - A tasty traditional slow-cooked stew made with shellfish (usually mussells) and soya sauce. Bol de Cus-Cus - A delicious cake made with corn and sugar, usually served warm with butter and cabra cheese. Cado de Peixe ou Caiderado - Potato, pumpkin, carrots, vegetables cooked with fish (usually Cavala) and tomato puree. Canjo - Soup with chicken, rice, onions and carrots. Bafas - Fish cooked with tomato, onion and peppers in breadcrumbs, served as a snack or an appetiser. Percebes (Sea Fingers) - Funnily enough they look like purply brown fingers. You crack off the end and peel the skin to reveal the meat (similar texture to squid). Queijo de Cabra com Doce de Popoia - A typical dessert with slices of cabra cheese served with popoia jam. Carpaccio - Raw tuna sliced finely and marinated in lime, oil & salt. Tuna Tartar - Raw tuna chopped and marinated in a soy dressing. Feijoada - Pork stew with vegetables and beans. Morreia - Eel, fried in oil. Lagosta suada - Steamed lobster. Grogue - Locally produced from sugar cane to make this strong alcoholic drink. Fogo wine - Very pleasant when drunk at the right time but can be hit and miss depending on the age of the grape. Caipirinha - Brazil inspired cocktail made with sugar cane and local liquor.